Roger O’Steen, Senior Partner and Chairman of The PARC Group, developed more than twenty communities throughout the Southeast and Texas before beginning projects in Northeast Florida and the master-planned Nocatee community. O'Steen also directed the development of seven golf communities and courses. Hidden Hills, located just east of Austin, TX, is a gem of a golf course that offers a high level of quality in a scenic and cozy setting. In 1985, as the course finished completion, golf legend Arnold Palmer played the ceremonial opening round on Lake Travis with Chester Stokes and Bucky Ayres. It was a big event that drew an estimated 500 people. O’Steen recalls Palmer flying in the day of the event with a bad cold and aching back, but responding like the legend that he is. “He was a true gentleman, shaking hands all day and hitting impressive drives. You never would have known that he was not feeling well,” O’Steen said with a smile. 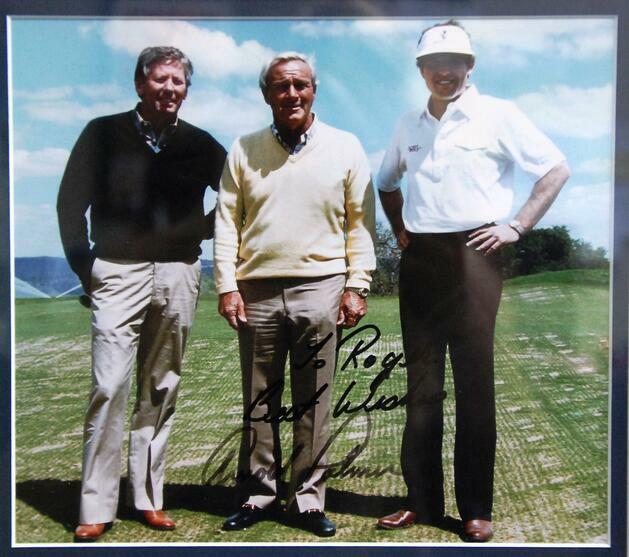 Pictured (from L to R): Chester Stokes, Arnold Palmer and Roger O’Steen, circa 1985.